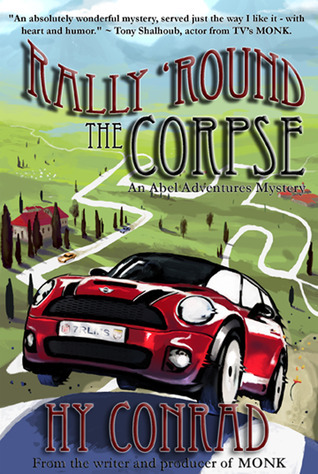 In the series debut, “Rally ‘Round the Corpse,” we meet Amy Abel, two years after the death of her fiancé. Amy needs a fresh start. And what better way for a shy, risk-averse woman to start over than to sink her savings into a travel agency specializing in adventure. Her first project? A mystery road rally through the European countryside. At the starting line in Monte Carlo, Amy finds herself attracted to Marcus Alvarez, the most mysterious of her two dozen game-loving clients. But the rally gets off to a rocky start when an eccentric writer, the only person who knows the game’s solution, is himself murdered back in New York. Weird accidents begin happening along the route and Amy discovers that this fictional mystery was based on a real, unsolved case, one that Marcus knows too much about. Now she has no choice but to join forces with Fanny, her domineering mother, before the killer strikes again. “Forty-three. But it’s double-spaced.” The man actually seemed amused. Fanny wondered if she might be losing her touch. She tried again. “This is supposed to keep our mystery fanatics occupied for the next two weeks? For all the money we’re paying you…” She let the words dangle. Otto Ingo remained unscathed. “Send this to your daughter in Monte Carlo. It’s all she’ll need to start the game, I assure you.” There was a certain condescension in his calm, as if he were explaining things to a very dense child. It was a trick Fanny recognized from her own arsenal. This guy was good and it irritated the hell out of her. “Of course she did,” Fanny stammered. She hated not being in control. Unlike her daughter, Fanny had rules that generally succeeded in avoiding such situations. Number one: never do business with people you didn’t know during your husband’s lifetime or to whom you aren’t related, preferably by blood. Otto failed on both counts. She had known him for only… How long? It had been perhaps a minute since the eccentric, disarranged figure had walked through the door of their Greenwich Village travel agency. Owlish. That was the word Amy had used, and it fit—the small stature (no taller than Fanny herself), the pear-like shape, the thick, round glasses that tried their best to add substance to the face. Fringes of white, wispy hair wreathed his face and if Fanny squinted, they could almost resemble feathers. Otto was decked out—“dressed” didn’t quite do him justice—in a suit of gray, wool tweed. The cut was almost Edwardian, so old fashioned that it could be mistaken for avant-garde; some London trend that had yet to make it across the Atlantic except for maybe a few isolated outbursts, like the arrival of a flu strain. But the material showed signs of age. Food stains peppered the sleeves. And the details were of such poor quality that Fanny decided it had never been fashionable, even when new. The illusion of a ruffled breast was accomplished by a bulging, wrinkled, white shirt accented by a clip-on bow tie that bobbed so dramatically when he spoke—so irritatingly hypnotic—that Fanny knew it had to be deliberate. Intimidation by annoyance, an advanced ploy that she herself rarely dared. This bird was a pro. “The entire game is written and ready to play.” Bob, bob, bob. Fanny had to force her gaze down to the manila envelope. “Every day your daughter will receive new instructions. All taken care of.” He was reaching across and tapping at the final invoice paper-clipped to the corner. “What about the ending?” Fanny contorted her own squat frame, hunching down in her leather swivel chair and trying once again to force her opponent into eye contact. “Shouldn’t we know how it comes out? You know. Killer? Motive? Inconsequential things like that.” With a bit of eye contact, she might just regain her footing. “What if something goes wrong? If no one can solve it, or if a clue gets lost. Amy says she would feel more comfortable…” Were his eyes peering up at hers through the bushy eyebrows? She couldn’t tell. “I’m sure. But that’s not the way I work. You’ll notice the item listed as ‘assistant fee.’ Another reach and a tap, and this time Fanny couldn’t help glancing at the invoice. The glance turned into a gape. “Yes, of course. But…” But such an expense. Fanny straightened the tan, pleated blouse that Stan had told her—in one of those rare, romantic moments when the taciturn man knew he had to say something or face the consequences—so perfectly set off her brown eyes and auburn pageboy. Now, three years after his death, the blouse, a bit tattered around the cuffs, was still her first choice out of the closet. With a sigh, she opened the center drawer of the Chippendale-style desk that had once been in the corner of Stan’s den, took out the company checkbook and began to write. Why couldn’t Amy have opened a normal travel agency like everyone else? Between them they surely knew enough New Yorkers seeking European culture or sunny beaches. But no. Despite Amy’s timid nature, she’d wanted to specialize in the exotic. Abel Adventures. At least Fanny liked the name. Abel Adventures would be different, Amy vowed, shunning the usual low risk, high volume stuff. The internet had already destroyed that end of the market anyway. No, they would concentrate on customized excursions. Fanny suspected the idea had been inspired by Amy’s fiancé, Eddie. Eddie McCorkle, bless his soul, had been the adventurous half of the relationship. He’d always been eager to drag Amy someplace new, talking her into a trek on the Inca Trail instead of just a week on another Caribbean island. Amy would fret for weeks before each trip and then wind up loving every minute. They’d even fantasized about writing travel books some day. To work together, to travel and see new things. Some day. “Some day” had ended two years ago with Eddie’s death, just a week after he’d popped the question. Stan gone, and then Eddie, in less than a year, leaving a widow and an almost-widow, both of them too young not to start over. But was this the way to start, Fanny wondered. It was as if Amy were pushing herself to be someone else, someone more decisive and adventurous. Fanny just hoped she was up to it. “The Monte Carlo to Rome Mystery Road Rally”—Fanny knew she didn’t like this name—was a perfect example of the new Amy. A high risk, high profile venture that put them at the mercy of the bank—and of an eerie bird of prey named Otto. She wrote as slowly as she could. Otto took the “1” train from Christopher Street to Times Square. From there it was a short walk to his apartment, a dingy, two-room depressant that had been home for the past several years, ever since his bedridden wife had gone on to her much deserved reward. It was on the day of her funeral that he placed on the market the Brooklyn row house that he’d been born in, married in, and grown old and stout in. Over the following week, the sanitation department was faced with the chore of carting away dozens of perfectly good pieces of dark, heavy, walnut furniture left out at the curb. Otto was throwing out anything and everything that might remind him of the unhappy eternity of his life there. And although his simpering niece—his wife’s niece, actually—had repeatedly begged him to save her the photo albums and the dinette set, out they had gone with the rest in a frenzy of anger and excitement. His books—the research books, the classic mysteries from which he mercilessly stole plot twists, plus the prized, bound scripts from his own games—all of these went with him, but little more. Along Eighth Avenue, a breeze stirred the street debris into curbside cyclones. Otto joined the crowds elbowing past the cheap storefronts that asserted their stalls halfway out into the bustling sidewalk. A stray front page of this morning’s Post tangled itself around his black Florsheims, jumping from one foot to the other, screaming out an old headline as it refused to let go. Otto flowed with the foot traffic. Ignoring the chaos, he concentrated on the game he’d just delivered, mentally reviewing the twists and turns, imagining the players’ reactions and pre-guessing their second guesses. Designing mystery games was a specialized skill. But within this small, almost invisible world, Otto Ingo was king, a living legend. That’s how he preferred to think of himself. A block south of the Port Authority Terminal, Otto turned into an open vestibule, a shadowy alcove reeking of urine. He used his key on a reinforced steel door and began to wheeze his way up the four flights that led to the grimy door of the mystery king’s lair. One step at a time. Arduous minutes later and he was depositing his overstuffed body into the deep, form-fitting depressions in his overstuffed sofa. It was only as his own gasps were fading from his ears that Otto realized he wasn’t alone. With a start, he glanced up at the outer door, the door that he, in his oxygen deprivation, had neglected to shut behind him. On the two windows that faced Eighth Avenue, the blinds were lowered, permitting a few slivers of dusty light to squeeze between the carelessly skewed Venetian slats. Otto had not yet switched on a lamp in the apartment, and the naked bulb dangling from the stairwell ceiling turned the figure in his doorway into the blackest of silhouettes. The figure glided in and gently closed the door, plunging the living room into darkness. The owl’s eyes blinked and slowly adjusted. Among the shadows, a profile, then the outline of eye sockets, cheekbones and a mouth came into focus. The face was vaguely familiar. “What are you doing…” He stopped speaking when he saw the gun. Despite his exhaustion and growing alarm, Otto regarded the firearm with a curious eye. Even in this light, even with the barrel pointed directly at him, he could recognize it as a .22 pistol with a silencer, a muffler as the English called it, screwed onto the muzzle. A small gun, but as deadly as anything at close range. He wondered if he had enough breath left in him to scream. At the same time, he was fascinated by his assailant’s face. So familiar, yet not. “What do you want?” The intruder didn’t reply. Not a good sign. “I have a couple hundred dollars,” he said. But he instinctively knew money wasn’t the object. “I have a credit card, too.” He didn’t, but at this point he was just looking for a response. The figure didn’t move, but seemed to be waiting—nerveless, emotionless. Waiting for what? The only sounds in the stale, greasy room were Otto’s labored breaths and the normal abuse from Eighth Avenue: the impatient blare of taxis as they jockeyed for position by the chaotic entrance to Port Authority, and the rhythmic clunk-a-clunk of tires passing over an ill-fitting construction plate in the street. It was during one of these clunk-a-clunks that the figure fired. Otto had read about thousands of fictional deaths, had personally staged dozens of them, but had never before been on the scene of a real murder. In his rare moments of self-doubt, he had wondered if his re-creations might be too clichéd or unrealistic. Did shooting victims really convulse with the impact, then go limp in their chairs as the life drained out of their bodies? He slid from the sofa to the floor, leaving a smeared trail of red against the dirty corduroy cushions as he fell to his knees and then collapsed forward. His brain was far too woozy now for clues. Besides, he truly had no idea who had killed him, which was annoying both on a personal and a professional level. Otto’s next thoughts were of the regrettable differences between factual and fictional murders and how, even discounting his current situation, he much preferred the fictional. Thanks so much for hosting me on your site. It’s a wonderful site — I’ve already found a few new books that I need to read. Thanks! Thanks for taking part in the tour and hosting Hy!